The Horizon treadmill Paragon 6 is of sturdy workmanship and allows a joint-gentle running workout with its absorption system and the orthobelt mat. 15 programs provide motivation, real distances can be simulated with the treadmill and shown on your tv with the optionally available Passport system. The Horizon treadmill Paragon 6 can be folded space-efficiently. Treadmills of the brand Horizon Fitness feature an excellent workmanship, a sturdy quality, a high running comfort, and the use of innovative technologies. All Horizon Fitness treadmills, except the Elite TPRO, are equipped with the practical FEATHERlight folding system. 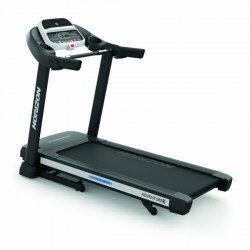 Horizon Fitness offers different treadmill model series for any requirement. 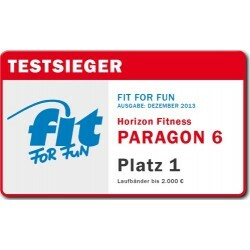 The Horizon Fitness Paragon treadmill series is very successful. The 2.5 HP powerful digital drive motor, the big running surface (150 x 50 cm) as well as the innovative VCS shock absorption system are reasons, why the treadmills of the Paragon treadmill series belong to the most popular treadmills. The motor is an important quality feature of a treadmill, the heart of the treadmill. As all models of the Horizon Fitness Paragon treadmill series are equipped with a 2.5 or 2.75 HP strong motor, they are recommendable either for experienced runners as well as users with a weight of up to 110 kg. The Premium models of the Paragon series, the Paragon 8E and the Paragon 7E, are equipped with a 3.1 mm strong Orthobelt running mat and the high-quality VCS shock absorption system - providing a maximum of comfort during the cardio training. This special absorption system makes possible that the running surface of the treadmill is divided in three zones of different degrees. The adjusted absorption supports the user in every single phase of his/her motion and provides a natural motion sequence. The treadmills of the Adventure treadmill series feature a good price-performance ratio. The models of the Adventure treadmill series are optimal for beginners and leisure runners. A top model of the Adventure series is the Adventure 7 - thanks to the 2.5 HP powerful motor with digital drive system and big running surface (153 x 51 cm). The Elite series of Horizon Fitness is optimal for running enthusiasts and all those, who want to become one. The excellent Hirzon Elite treadmill series is the perfect combination of an impressive running comfort and sovereign detail solutions. The high-quality treadmills of the Elite series are equipped with strong 2.5 HP to 3 HP continuous output motors with digital drive systems. 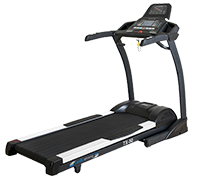 Depending upon the model, the Elite treadmills are equipped with a 4.4 mm strong running mat (so called Orthopedic Belt) with a balanced shock absorption, which provides a very joint-gentle run. 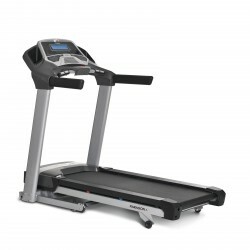 The Elite T4000 is one of the best treadmills of the company Horizon Fitness. In the test of the ETM Testmagazin 07/2015, the treadmill received the mark "A" with 92.0 % thanks to its excellent equipment. The new Citta series of Horizon has been designed to fit to your style, your home, and your wish to be more active. Citta is the Italian word for city; the fitness machines of this series are made for urban living environment. The colour concept is convincingly simple, precious, and classic: matt-black with golden components. Thanks to its clear lines, the Horizon treadmill TT5.0 does not dominate your living environment but adapts softly to your home. Via the separately available delivery table, the treadmill can be transformed into a mobile working place - ideal to improve your fitness while working at office or doing home office. The handles offer more safety while doing the treadmill training, especially for training beginenrs and older users. Besides the precious treadmill, the Citta series also includes an upright bike (also available with delivery table) and an elliptical cross trainer. Depending upon the model, Horizon Fitness offers complete entertainment and programme features for even more training motivation. The intuitive displays of the smart treadmills provide a direct feedback with respect to relevant training data and inform about the effectivity of the training. Passport is the interactive training software for the treadmills of Horizon Fitness, which are marked with "Passport Ready". Connect your television and your treadmill with the Passport Media Player - and you can train with the HD route videos all over the world: four audio sets with six target routes each.